3 Approving Comments Or Not? 5 What About The Site Of The Commenter? 6 Do You Ever Edit Blog Comments? Most readers know the basics of blog commenting. It’s the more awkward decisions that I’d like to discuss today. Err – yes…. discussing! I’d really like your input on these questions. I genuinely struggle with the answers. For each blog commenting question, I’ll make a few notes about what I currently do, but my opinions aren’t cut-and-dried. In fact I’m human, not a bot, so they often change depending on how I feel on the day. Of course I could just be plain wrong, and I will be inviting a few pro-bloggers for their opinions, as I’m more than happy to learn from experts. So if you think I’m wrong – PLEASE tell me and I’ll mend my ways. About 14 months ago, in August 2016, I wrote an article about whether I should switch from using CommentLuv to using the Disqus comment system. It quickly became one of my “most commented on” articles, so much so that I turned off commenting! At the time the response was pretty much AGAINST Disqus. In the end, I was having so many problems with my theme and CommentLuv “not playing nicely together” that I had to remove CommentLuv and stick with native WordPress. Since then I have had dreadful spam problems, despite going to “paid” Akismet, having a dialogue with Akismet support, and trying every anti-spam comment plugin that people kindly suggested to me. These days I see several pro bloggers using Disqus. Has anyone’s opinion changed? No need to restate the arguments pro and con Disqus, they were covered well in my previous post. I’m just interested if there has been a change of opinion in the last 14 months. The above topic is just an aside – I’m more interested in answers to these other questions about blog commenting…. It’s my intention to expand on the topic of blog commenting, NOT to offend anyone. Most of the bloggers who leave comments on my site are of the same mind as I am and I appreciate the time you spend on my site. I’m interested to learn how others handle the decision making process. From the days when I naively approved every “Awesome post” on my first truly appalling blog, I have become progressively more brutal. I suppose it depends on what you believe the purpose of blog comments to be. My wish is that they form a dialogue – maybe expanding on something I have written, or providing an illustration of an alternative and probably better way to do something. If I am right, and you agree, how do you feel about a commenting exchange that goes like the one shown here? OK, so I now have two more comments than I otherwise would have had – but…..
Do I look desperate for comments? Will other bloggers get bored reading comments like this and leave without looking for more interesting comments? Bluntly put, we’re ALL busy people, would it have been better if we both saved our time? Did the commenter actually read the article? If a topic title has no interest to you, is it best to skip it altogether and spare each other’s “bounce rate”? How do I handle this in communities where the “commenting etiquette” is to reply and reciprocate? Some bloggers comment and leave a link on my post, but their own blog remains untouched for weeks and I’ve commented on almost every post they have published. What do I do then? We know Google evaluates the quality of site content – and comments are presumably content too. So does anyone know if Google is yet smart enough to make any judgements about the quality of comments on our blogs? Sometimes spammers can be clever. They make a decent length comment just “relevant” enough that it could be genuine. If you’re not sure if a comment is spam use this tip on finding clever spam, paraphrased from Adrian Jock‘s excellent blog. Copy the last 3 or 4 last words from a sentence immediately followed by the first few words from the next sentence. Do an exact (in inverted commas) Google search for it. If it appears several times as a comment, there’s every chance it’s “clever” spam. What About The Site Of The Commenter? If someone has left a good comment but their site is in a language I don’t know, I can’t tell if it’s a “bad site” or not. Is it ever “right” to remove the commenter’s site and leave the comment? Tips welcome please. It was actually a comment of exactly this nature that prompted me to write this article, although these questions have been bubbling in my mind for a few months now. I have heard it’s best to have comments mostly within my own niche – but I don’t stick to this. 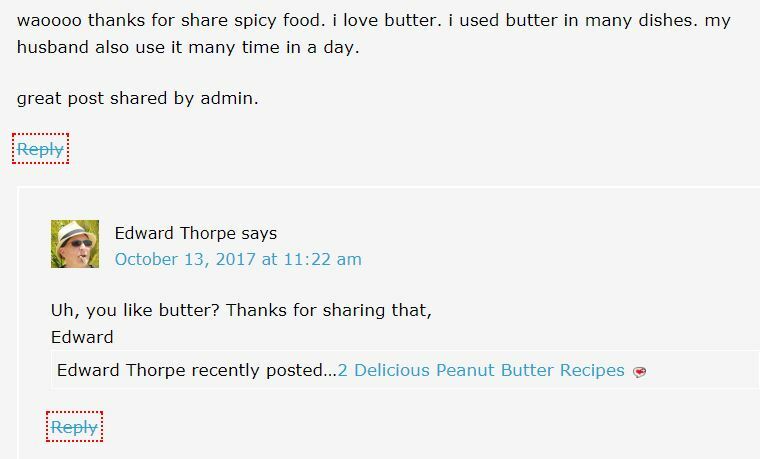 If I did, I wouldn’t be enjoying the exchanges with one of my favorite blogs: FarSideOf55.com And with perfect timing, Edward’s responses to “classic” comments, such as the one shown below on a post about peanut butter recipes, just crack me up. Do You Ever Edit Blog Comments? I’m a little OCD about grammar / spelling on my site. Yes – I do make mistakes – but PLEASE point them out to me and I WILL fix them – it matters so much to me! If I see a grammar or spelling typo that I know a blogger wouldn’t normally make, to spare their blushes I correct it. Please do the same for me if I blunder on your blog comments. I always spot them just after I hit “Submit”. When a blogger whose first language (apparently?) isn’t English makes a good point, but it takes me about three “readings” to understand what they’re trying to say. Is editing comments under circumstances such as these, wrong? I hope the points raised above don’t make me appear as if I don’t like / value blog commenting. When it’s done properly I love it. When it isn’t…. well, it’s not an effective use of anyone’s time. A shorter than usual article today, because I’m looking for your answers rather than providing them! Hopefully by the time you read this article some pro bloggers will have left comments so that we can ALL improve the quality of our blog comments. my authority in the online world. Through this only pro bloggers like you and many more have known me. But here are few things which I need to catch up for leaving a more decent comment on to other blogs. You make a good point – when someone just leaves and “awesome post” type comment on my blog no-one can know whether there’s a real person there or just a “bot”. It’s no basis for building a relationship of any kind, let alone a business one, which is what most bloggers are hoping for. Generally comments that go above and beyond this will get approved. I even approve comments where I don’t agree with the point of view, because people have a right to make their point, and I have the chance to reply. Certainly it was through your comments on my blog that it has been my pleasure to get to know you better. Blog commenting is powerful because when we leave a good comment on someone’s blog…(after we actually read it!) other people see it and can reply or mention what you have written. It happens on my comment section all the time. Things like “as Joe Blow mentioned: ….. ” and this keeps the comments flowing. I think it comes down to the approval ratio. I usually won’t approve those one liners. Akismet has been okay, but some spammers do slip by; usually on older posts. I like the tip you have given on how spammers operate paraphrased from Adrian Jock‘s blog. So that’s how they do it Eh? Hmmm no wonder why I cannot rely on the plugin anymore. As for switching from WordPress I haven’t yet. So far so good but the moment there is trouble I know I will have to switch. I appreciate you taking time to reply to my commenting questions because I always look to your blog as a good example to follow, and the comments people leave on your articles are usually helpful, interesting and DO contribute to the discussion. Which, as you say, is the value and power of commenting. I’ll feel a little more confident with a stricter approval policy for denying the one liners. Adrian Jock is another blogger whose opinion I value and I have learned a lot from him over the years. 2) Usually I don’t approve that type of short comments. There are exceptions though. If such a comment is submitted by someone I know (for example, someone I chit-chat frequently on social media, a subscriber, etc), then I approve it. I appreciate your answers to my commenting questions and look forward to seeing what other people think. Perhaps that’s my answer… to have a public Comment Policy, then I can make these decisions with a clear conscience. How irritating have had your correct grammar turned into incorrect! Agreed, I would have to be 100% sure before making a correction. Thanks for your reply – and for giving me such a useful tip that I still remember and use to this day. Hi Joy, I’ve been thinking of making a switch but CommentLuv seems to be working now if users use HTTP instead of HTTPS when leaving their site or blog name in the field for leaving a comment. I’ve read more and more on Disqus and saw you could even make money from it but I’m not ready yet to make a switch. I have noticed more pro blogger using it though too. I too don’t tend to approve short comments unless I know who they are. I also need to have an avatar preferably a photo of them before approving too. Great discussion here Joy. Thanks for sharing your thoughts on this one. Yes! I forgot to mention avatars. Glad you reminded me. Someone I don’t know and without an avatar runs a big risk of not having their comment approved. Hmmm – perhaps it’s the fact that I haven’t yet gone over to https that’s getting me so many spam comments. But, then again…. I read “somewhere” that if you received a comment without an https, that nullified your own https. Sigh… all getting too confusing LOL. I never wanted to get involved in the technical side of blogging. I was quite keen on Disqus – I’d even forgotten the bit about making money. I haven’t found it cumbersome, as some people did, because once I was signed in once, it was fine for the rest of the day. The debate continues! Ï used to hate sifting through spam to look for comments quite often they just cruddy little ones like “Great article way to go on doing that try my site”. 5+ plus years ago when I was last into all this that was a big problem for me, like you I tried various plugins like akismet etc. I did in the end get it sorted out though with ReCaptcha. If you’re not using it and so far it doesn’t look like you are I highly recommend installing it now. Go to: plugins->new and then search for Google ReCaptcha and select the best looking one. After installing it you’ll need to set it up via your Google account. The plugin should help with the setup. I don’t use anything else now not even akismet. I do have JetPack to protect from malicious attacks and attempted logins. I like that information about how to search out potential comment spam. I usually allow links on my site as I believe they can be a further source of information. Thus when I comment I try and link to a relevant post I have written. If I haven’t written anything related to the topic I a link to my main domain name as I like to talk on many different topics and it may be of interest in that fashion. Thank you for a great and thought provoking article! Glad you feel the same way that I do about the stupid comments, and that you liked Adrian’s tip about finding comment spam. Yes, I would allow relevant links, and include my own where suitable. The ones I disallow are….. “Great article. Get your car serviced at FredCars.com” type! Thanks for the suggestion about the Google Recaptcha plugin. That’s definitely one I haven’t tried before, so I’ll have a go and hope it’s an improvement. Hi Joy! Great discussion on blogging comments. This is a subject near and dear to my heart. I love Disqus, and used it for several years, but took it off because too many readers were complaining that they didn’t like it. I am thinking of testing it again on the new blog I’m setting up to see if it’s any different. I love the idea that Lisa mentioned about having a comment policy. I have one in my head, but it’s not written down anywhere. Short comments, obvious spam comments, and comments that lead to sites in another language all get deleted. Thanks Ruth, good to find a Disqus fan. Would love to hear about your experiences if you try it again. Glad you comment policy is about the same as mine – and mine isn’t written down either. I don’t think the spammers would bother to read a comment policy but at least some of the humans who comment might finally get the message. Sometimes people write me and ask me to edit their comments, so it’s good I know how. I heard bad things about Disqus so I never pursued it. I have CommentLuv and am happy with it. It’s very irritating when you know you made a mistake on your comment, so I’d always be happy to edit someone’s comment if they ask me to. Shame about Disqus. I agree CommentLuv was brilliant, but it just won’t work with my theme. I see a Google Recaptcha now and pretty quickly so you obviously worked it out pretty quick. I’m pretty sure it’ll take care of the problem. Another thing to that will help is to increase the security of your website by installing an SSL Cert. An SSL Cert is a Server Side Language encryption for transferring and storing data. This will also help you with other things like SEO. It can be a bit of work to update everything though. To install and secure your site is pretty easy though. Simply search out SSL or Easy SSL in the plugin directory and well you know the rest. Google is moving to make sure all quality websites have these so it’s worth doing sooner rather later. All the best with the spam but I reckon you’ll have it covered now, even I fail the Google ReCaptcha trying to login to my own site sometimes! Yes! Got it installed after a little hiccough – thanks for suggesting it and warning me it wasn’t quite right. Yes…. SSL is something on my list, but I didn’t know it was as straightforward as a plugin. Is that all there is to it? Hey Joy! What a great post as well as great comments LOL I too have been thinking of making a switch but CommentLuv seems to be working for now again. HUM? I usually approve most comments, even one liners but do head over to check out the links that people leave and of course if they look spammy I delete them! I also like to have an avatar preferably a photo of them! Love the conversations you got going here girlfriend! Well I was tempted to switch to Disqus – but then Lesly made the excellent point that if they shut down, your comments go with them! I had to take CommentLuv off my blog, but native WP comments are doing the trick at the moment, so will stay “as is”. Funny you mention about avatars – I just commented on someone else’s blog and, whereas I normally have an avatar, on their blog I came up as a purple splodge, so would be in danger of being deleted if I applied my own logic! But don’t you think it a sad day when we have to assess whether or not a post is spam or not by the amount of ‘relevant content’ in the comment? There is no doubt that your blog post is thought-provoking and I enjoyed reading it. Honestly, my answer is that I’m not sure what to do with the spam comments. Although, I use Akismet and Wordfence. Wordfence does something useful besides providing the security. It blocks the IP addresses on your command, meaning, you can manually put the IP address on the blacklist and the chances are, it would help. Today, an automated spam bot left 42 comments on my blog, so I blocked the IP address. However, if I keep getting spam comments on a specific page or post, I closed down the comments on that page/post. As far as figuring out is concerned that whether or not the comment is original, I’d take your technique and check it out. Moreover, what I try is that whenever I comment on someone else’s blog or reply to comments on my blog, I always try to give away something useful that could help the other person. Thanks Hassaan and welcome to my blog. I used, and liked, Wordfence for a while – unfortunately my hosting company asked me to remove it, and I’m not entirely sure why – but at the time I was so desperate to move to a good hosting company and for them to repair my badly hacked blog that I did exactly what I was told to do. In fairness I haven’t been hacked again so they delivered great value there – but I am fed up of spam. That’s a good tip about closing down comments on a specific page / post, because it IS certain articles that seem to attract the most spam and I never really figured why. But as they’re older posts, I’d be quite happy to close off comments. So….. you DID deliver something useful in your comment. Likewise, that’s my definition of a good comment. How is it working out for you so far? With the SSL it can be as easy as installing a plugin like the one I suggested. This depends on your hosting setup, mine was that straightforward but I’ve gone to do a clients who hosts with HostGator and it wasn’t that easy – lol – Worst case scenario you might need to get your host to do it for you – they can offer free ones so don’t let them charge you if money is tight. I’m pretty up to date with all this stuff, so if ever you need any advice I’ll be happy to help. Certainly the amount of spam has gone down since I installed the Captcha plugin, so that’s been helpful thanks. Thanks for the offer of advice, appreciate that because I don’t stay up to date with technical stuff! I really like commentluv when it works, Adrian Jock has a fix on his blog that I wish more people would use. I like the idea of bloggers building a community and helping each other cross promote their respective blogs. As to fixing typos, I am highly appreciative of anyone fixing them since I never notice them untill I hit submit. I was a huge CommentLuv fan when it was working with my blog, and if I could have got it working with m current theme I would have stayed with it. The PAC blogging community is wonderful and membership has helped me so much. Haha – pressing SUBMIT is exactly when I spot my typos. Glad to find someone who feels the same as I do. I like the tip you have given on how spammers operate paraphrased from Adrian Jock‘s blog.